From Captain's Daughter to Army Mom: Aveda's Earth Month... And, a give-away! Aveda's Earth Month... And, a give-away! Did you know that since 1999, Aveda has set aside an entire month to love, celebrate and raise funds to protect the Earth and its peoples? Yes! Aveda has raised over $26 million since 1999, more than $20 million for clean water projects over the last 6 years. And, it's all because of phenomenal people, like YOU! Your generosity and compassion for people in need, no matter where they live on the planet, makes it all possible. 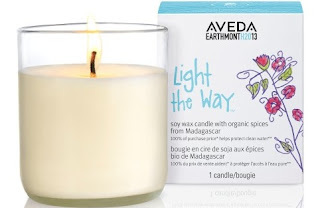 For me, the best part of Aveda's Earth Month campaign is always the limited edition candle. Each year there's a new scent and each year I think the scent is better than the last! These amazing candles are only available during Aveda's Earth Month campaign and, 100% of the purchase price of $12 goes directly to fund water-related projects! Since I think you deserve to experience the incredible scent of the 2013 Aveda Earth Month candle, I'm giving away FOUR! This year's candle is infused with warm, organic spices from Madagascar. I'll say it again this year and mean it... Best smelling candle, ever! You can order yours here or pop into your local Aveda experience center to grab one. Or three, or a dozen! This year, beautiful Aveda Earth Month 2013 campaign artwork tells the story of the village of Ampasimanjeva (Ahm-pahs-ih-mahn-jay-vah), Madagascar and what clean water means to them. The illustrations were drawn by children of the village showing the happiness clean water projects have brought to their lives. To see more of the artwork that tells how life improved after clean water was delivered, click here! I think it's amazing and hope you do, too! In 2009 Aveda Earth Month funded a project that brought safe drinking water to over 2,500 people in the village of Ampasimanjeva, Madagascar. It was a huge accomplishment, but there was clearly a need to expand the project and also help bring clean water to neighboring villages. In 2010 and 2012 GlobalGreengrants Fund and Aveda provided additional grants to expand the initial project and construct additional water systems in two neighboring villages. To date, Aveda's grants to the Association School have helped to drill three wells that use solar-powered pumps to bring water to storage tanks and ultimately to seven different stand posts in the communities. The School has also helped organize Drinking Water Committees so that community members have the skills and responsibility to maintain the water systems. Now more than 4,000 people have access to clean water. The most recent project is underway with plans to improve access to drinking water for an additional 8,000 people. To enter to win one of the four, 2013 Aveda Earth Month candles SpaBoy hand-picked for you, simply leave a comment telling me how much you love Aveda for their efforts to provide clean water to everyone on the planet. I'll pick four winners on Wednesday, April 16th... So do be sure to check back! Congratulations to: Nikki, Joyce, Gwen and Marilyn! I did a 5K on Saturday for our local Aveda salon and their donation toward Earth Day. My niece also owns an Aveda salon and spa about 25 miles from here, where I get my hair done. I love their products and the pampering I get every six weeks! Great job, Aveda, helping keep our Earth clean! Hooray for Aveda, great cause and effort in keeping our environment clean. Nothing better and big than this gesture, I love Aveda. Fabulous products and such a great cause. Nothing like keeping the earth a clean place. I really do love Aveda. This just makes me love them more. I'm ashamed to admit I've never heard of Aveda until this reading. I have heard of Earth Day and contributed to their cause. I think it is a wonderful thing Aveda is doing for our environment and getting water to everyone. I will certainly look into this worthy cause further. It is so nice when I company pays it forward...I love their products even more. Love their products and that they are helping this cause. I have loved Aveda for years and years. How nice of them to do this! I love Aveda products. I usually only get them for my birthday when they send the little email reminder to get a complimentary product at the store. Or if I stay in a hotel that has Aveda products. April is my birth month AND it's Earth month, this may be a perfect match! What I Saw Outside Today! You are my Sunshine Cookies for a Special Girl! Egg-Land's Best Eggs Brunch Prize Pack Give-away! Twin City Stage presents 12 Angry Men!